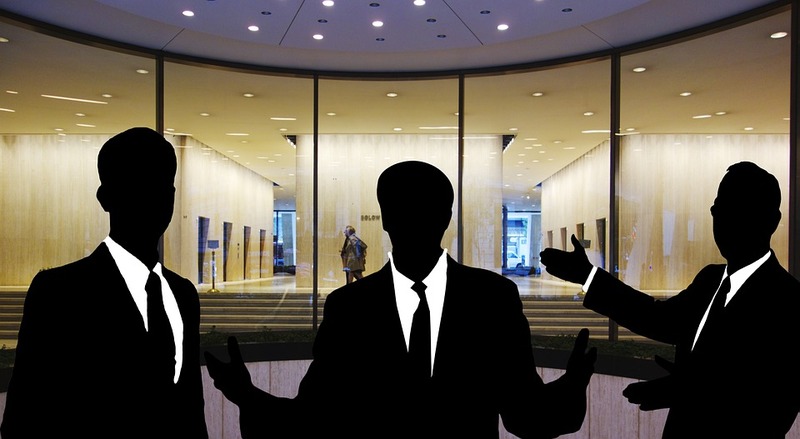 Ever wondered how large companies can still control its employees despite its immense number of their workforce? 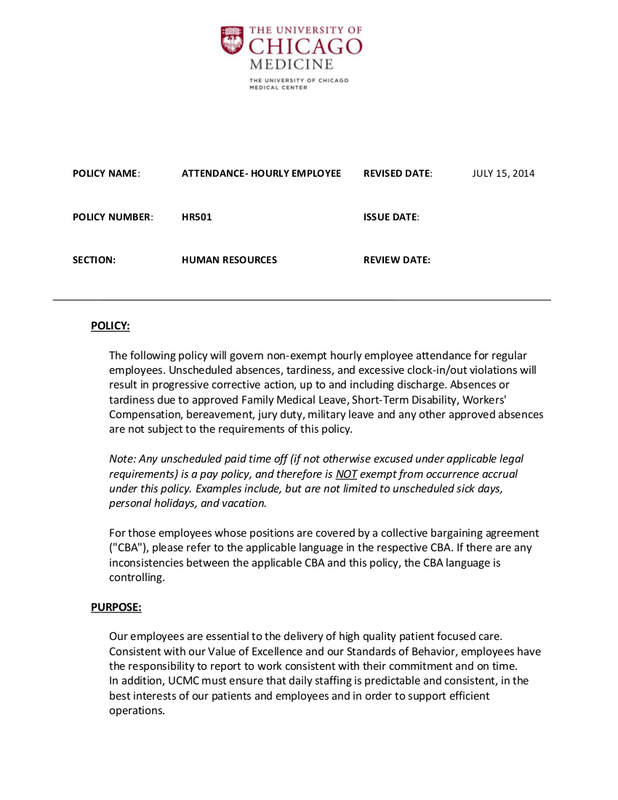 Aside from other employee-related policies that every human resources enforce in managing its people, like security policies, and social media policies, perhaps the most basic set of policies that every human resource management would use is the attendance policy. Imagine a company that has no clear attendance policy. Possibly, employees would be regularly late for work, or the worst, constantly absent. But absence is not only the worst part: it’s the obscurity of the sanctions and actions as consequences for tardiness and absence. Now how would the company succeed in that case? In short, a company that has no attendance policy is unimaginable. 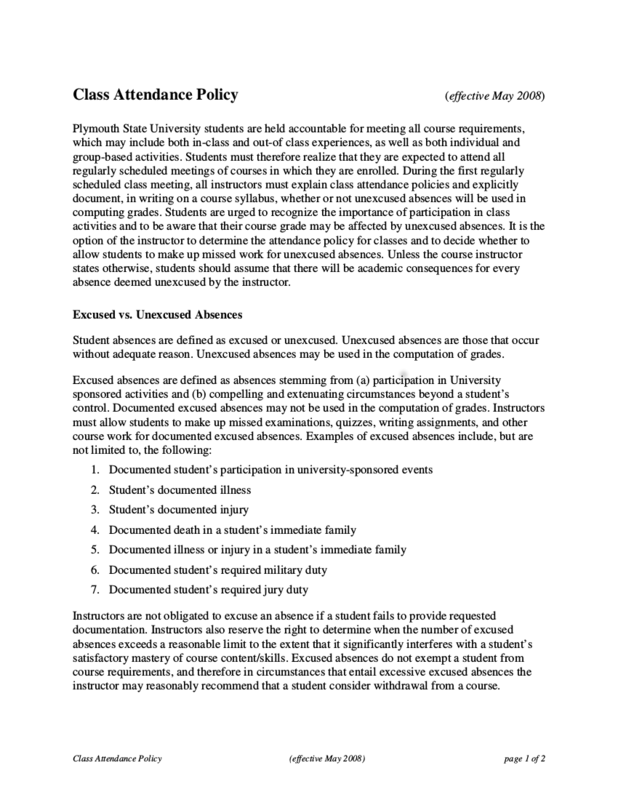 Any business, no matter how big or small, can impossibly operate without an attendance policy. 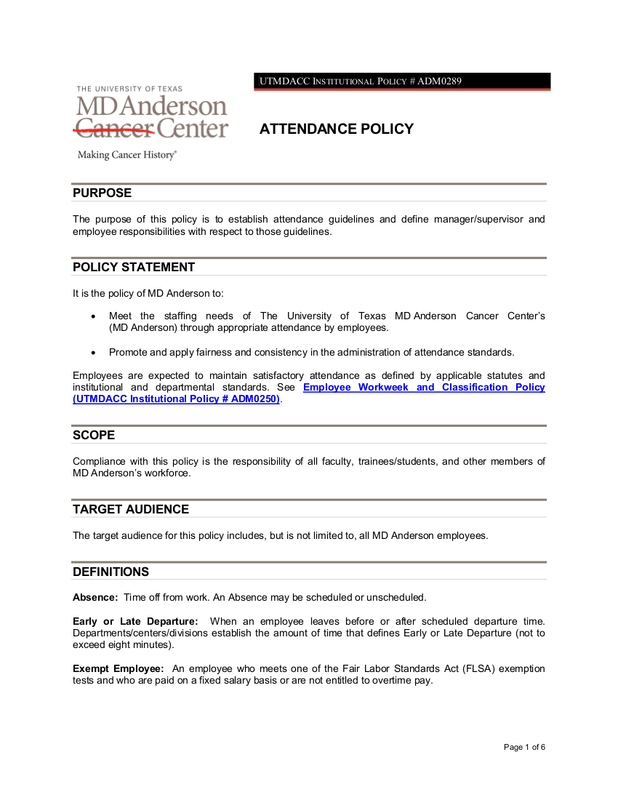 Attendance policies simply outline the company’s expectations on their employee’s performance in reporting for work. There are a lot of companies where punctuality is of great importance that even an hour of tardiness would already constitute to a one-day absence. However, an attendance policy does not only deal with the absences and the tardiness but it would also help the company in improving the efficiency and performance and enforce discipline on their employees. 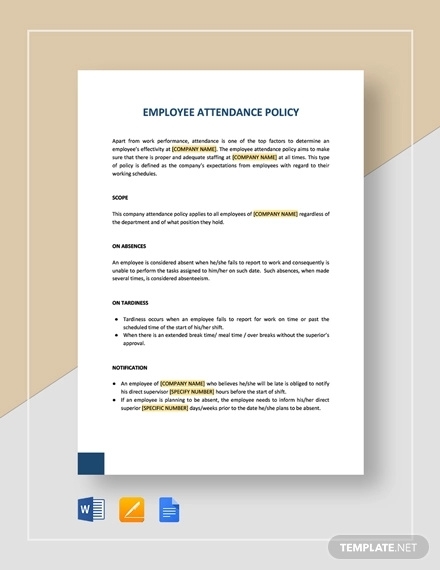 Attendance policies would generally help most companies in managing their employees’ attendance in a well-organized and competent manner. Policies procedure have helped a lot of business owners in regulating the possible consequences of every employees’ failure in complying the policies. On the employees’ side, it has also helped them in developing self-discipline. 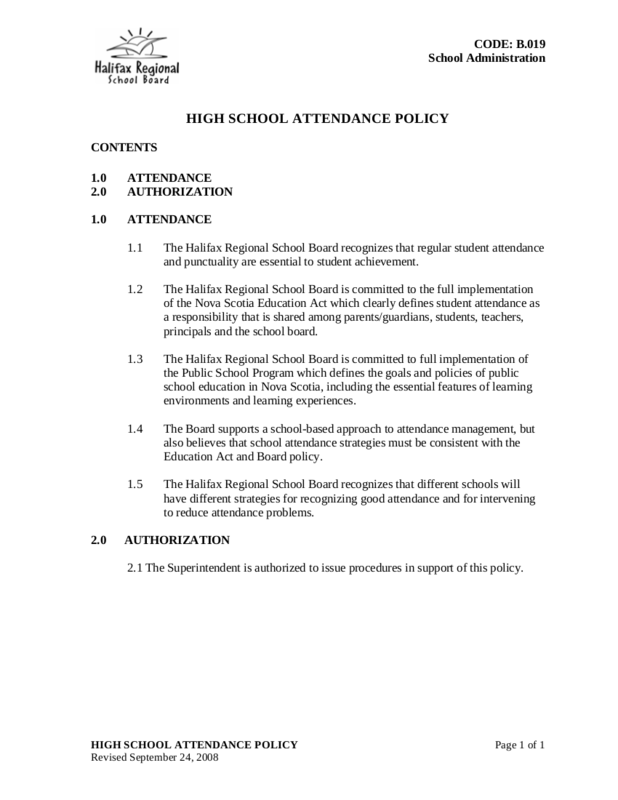 What Makes an Effective Attendance Policy? 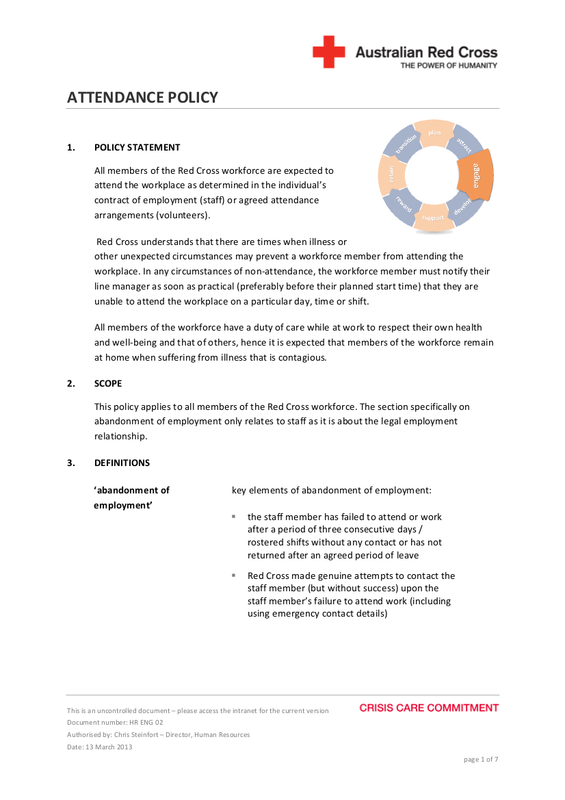 An effective attendance policy must always define the working hours of the employee. 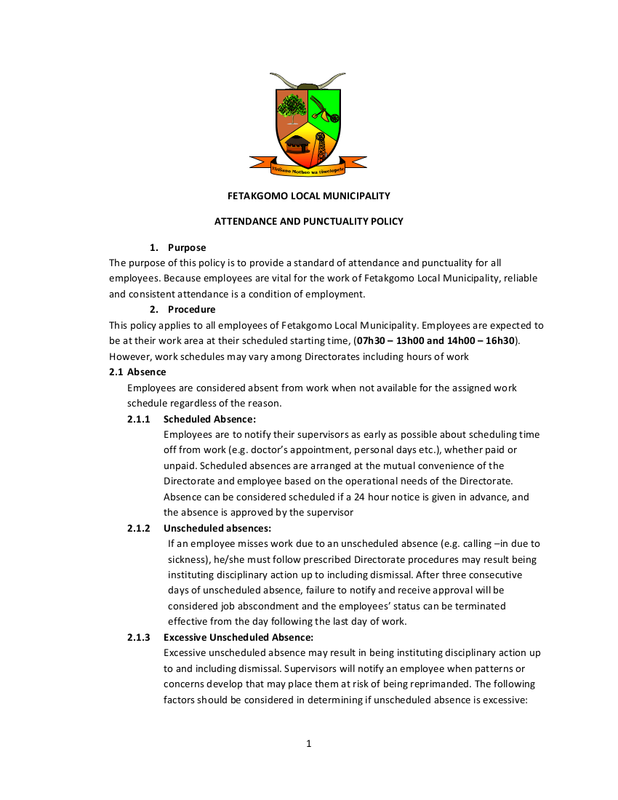 The employee would be doomed to be always tardy once an attendance policy would not clearly state their working hours. It must also include the duration of every break. There are some instances wherein a company follows a total of nine days of working hours with an hour of break. There are also companies that follow a flexible time-management schedule wherein the employees have the power to choose at what time they would clock in at a period of time. For example, the company would allow its employees to clock in any time between 7:30 AM to 10:30 AM, for as long as they would be able to complete the required number of hours. Let’s say, if an employer would clock in at 8:00 and that he or she is required to have at least nine hours, he or she must be able to clock out after 5:00 PM and never before or it will be considered as under-time. 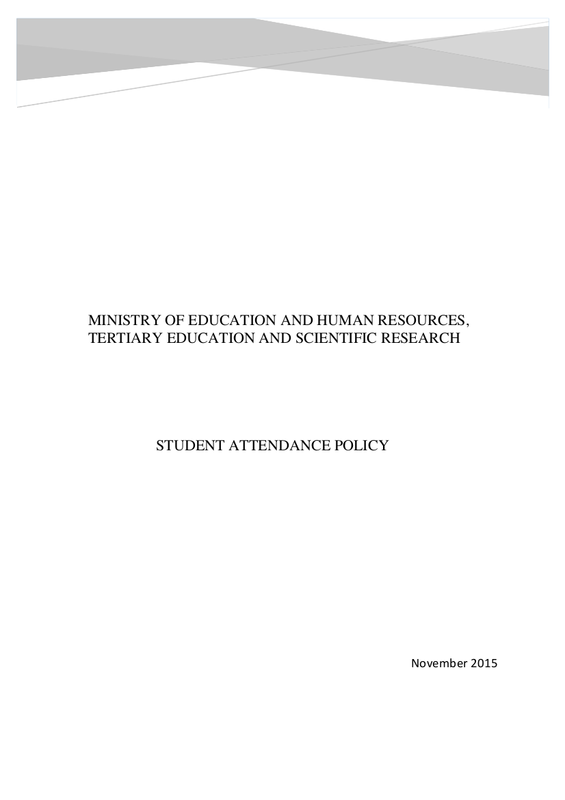 An effective attendance policy must also define its overtime and undertime terms. Having an overtime means that an employee has worked for more than the required number of working hours required by the company. On the other hand, having an undertime means that the employee has worked less than the required number of working hours. 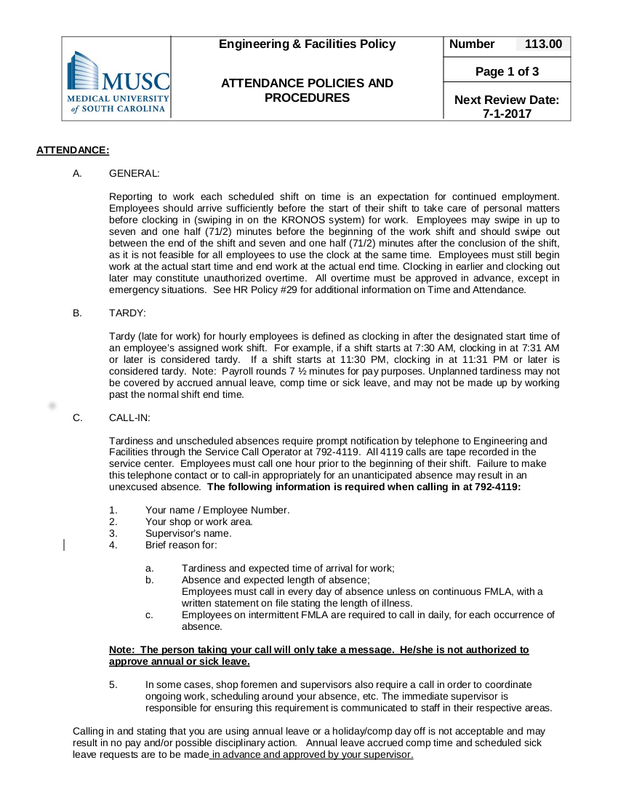 In some companies, to have an overtime or undertime, an employee must file for it. Any overtime or undertime that is not filed beforehand will not be considered and sanctions or consequences might apply. For example, an employee has decided to have an overtime since he or she plans to make up for a work that he or she has not yet finished and that he also wanted to earn an additional compensation. However, he or she has failed to file for an overtime, which is why that even if he has made up for his previously unfinished work, he or she will not receive an additional compensation for the extra work he or she has done. 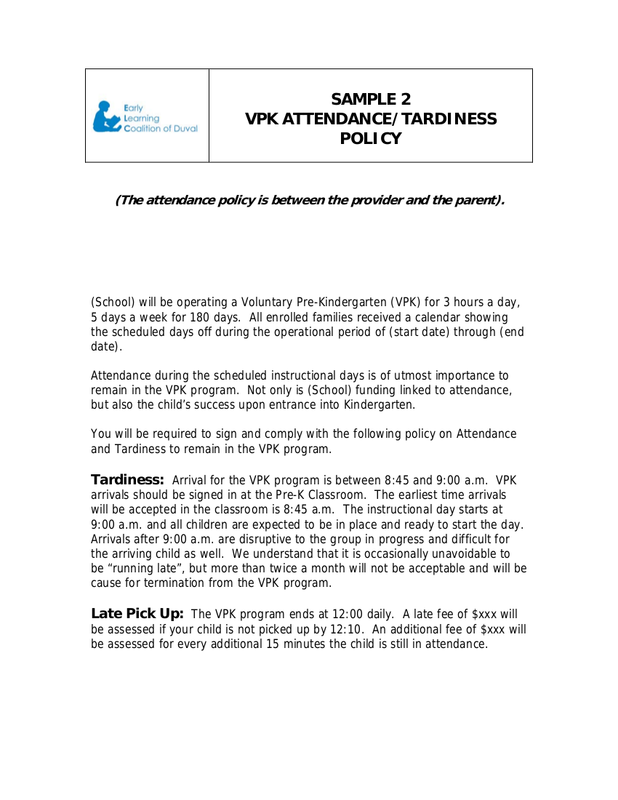 An effective attendance policy would clearly define what would be the consequences if an employee would be late or absent for work. The steps that should be taken whenever a violation would be committed by an employee must be elaborated in every attendance policy so that whenever infractions would occur, the management plans would be able to know what would be the actions towards any incident. It is considered as double-standard if there are only consequences for having failed to follow the rules set but there are no rewards for those who have followed the rules or policies set by the company. 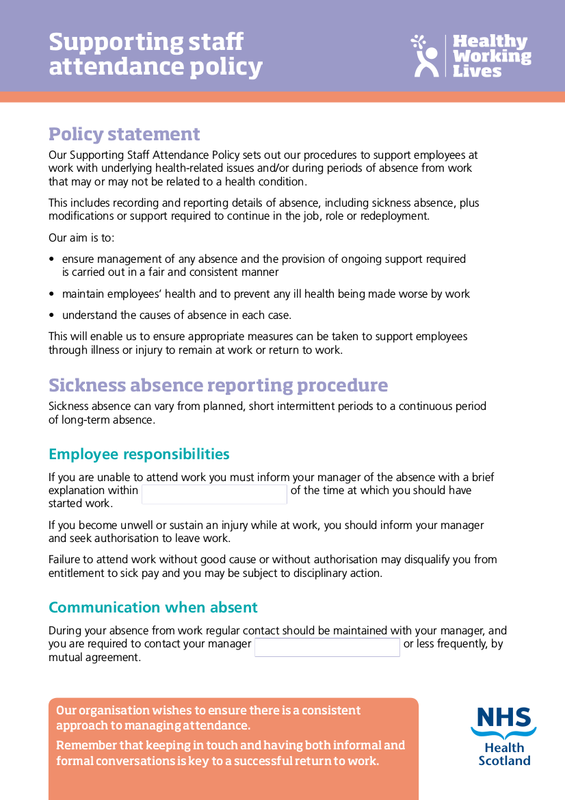 It cannot be avoided that there would be instances and circumstances that an employee would fail to report to work. 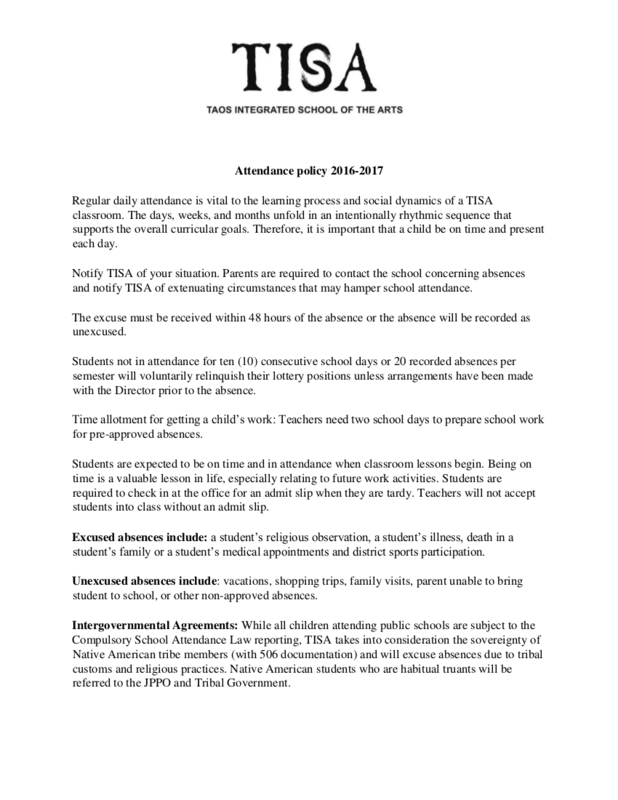 With that, every attendance policies must always cover all the possible leave applications that every employee can file or request for. 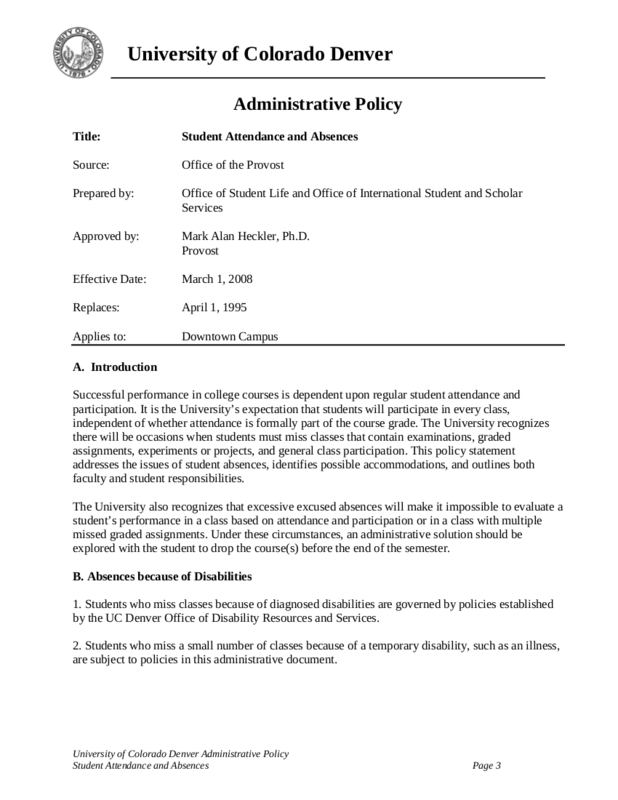 Underneath every leave, an attendance policy should also state the limit of the number of days of the leave and the exception the limit as well. 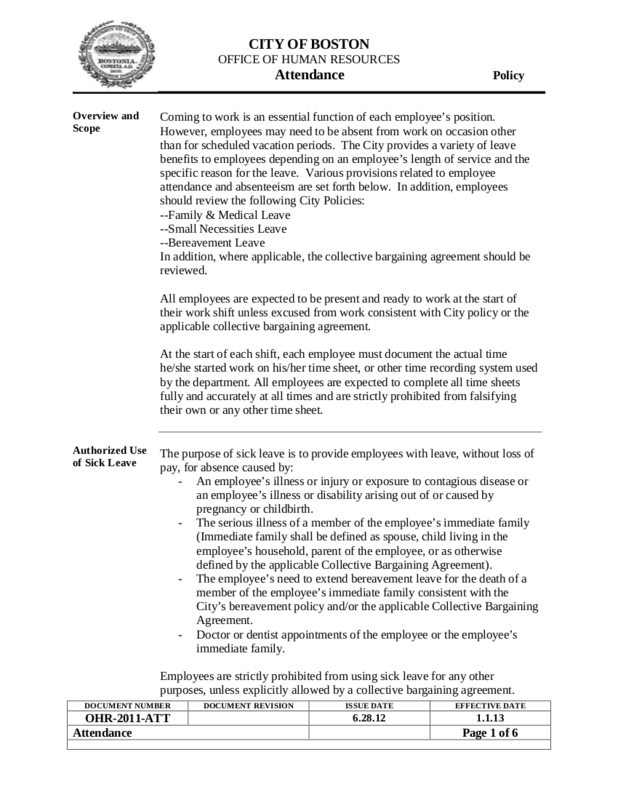 It must also include what are the prerequisites in order for a leave to be paid leave or an unpaid leave. 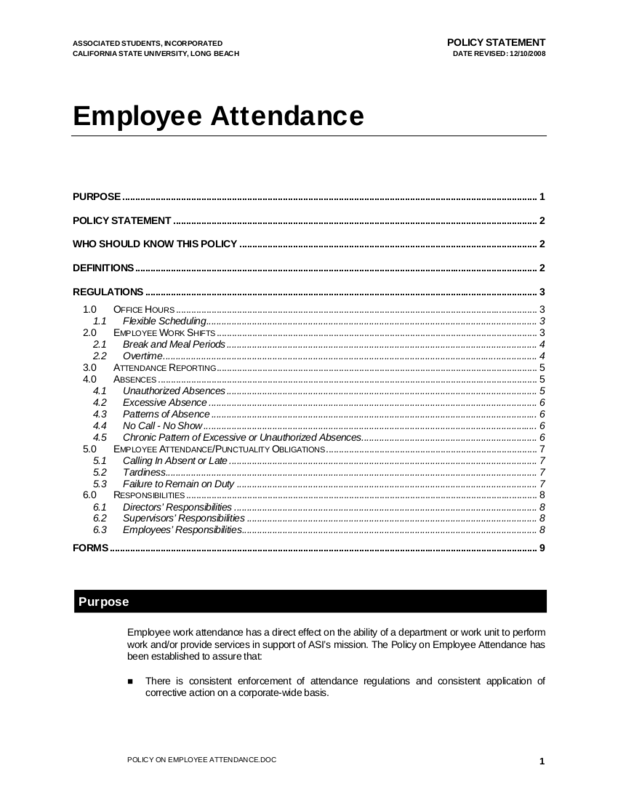 With well-written attendance policies, employers will be able to regulate the attendance of their employees. Employers have the power on how they would give consequences to those who committed infractions and give rewards to those who are punctual and practicing an excellent attendance. And since employees can regulate their employee’s attendance, employers or its human resource department’s business plan, would be able to manage their employees in an efficient manner. An employer would be able to outline their expectations towards their employees in terms of their reporting to work. Every employee plays an important role in every business out there, no matter how big or small might that be. Each position every employee plays is an investment made by the company. Every absence made by employees in the business would often result in a lot of the company’s productivity, earnings, and profits even in a single day of absence by one employee. How? For example, in a simple convenience store setting, the employee who is assigned to be the cashier was not able to report for the week. That is why the owner of the store, who do not have the luxury of time to be the cashier of the store and at the same time be the manager, would hire a temporary worker to replace his absent employer. Even if the owner is not obliged to pay for the absent employer, one of his other resources which is time will be used up for unnecessary activities such as contacting people who can possibly fill the job temporarily. And if the person he initially contacted, he would then take another time to contact another bunch of people and that would take another more of his time instead of just focusing on managing his convenience store. Sure, he can always hire another regular worker and not just hire temporary ones but that would also take another extra time and expenses which would’ve been unnecessary only if the supposed regular employee was able to report for work. Attendance is just one of the various work ethics. However, once this work ethic is properly carried out by every employee, then every employee’s other work ethics such as professionalism and respectfulness. Once an employee is punctual, he or she will be able to carry out other tasks effectively, that he will have a good relationship with his or her employers, and that he or she will also be able to work along with his co-employees harmoniously. The only resource that a company must not lose is not its finances but the people—the workforce. But the challenge here is on how the management will be able to ensure that their employees would not incur numerous unnecessary tardiness and absences. 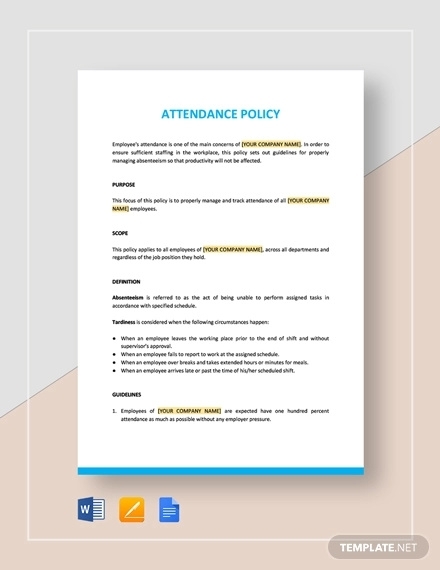 But attendance policies do not only benefit the employers, employees would also get something from these policies examples like discipline, obedience, good habits, and most importantly, an enhancement on every employee’s character that will help them in achieving success. No matter how excellent an employee is in doing his or her work but he or she has a lot of incurred absences and tardiness, then the employee would render nothing good to his employer.